The European Union added a significant financial underpinning to the struggling Ukraine government on Wednesday in the midst of the East-West crisis with Russia over Ukraine’s future, offering aid worth as much as $15 billion over the next two years. The offer comes on top of the $1 billion in American loan guarantees to ease Ukraine’s economic transition, announced here on Tuesday by Secretary of State John Kerry during a visit aimed at reassuring the interim Ukraine authorities and challenging Russia, which escalated the crisis last weekend by seizing control of Ukraine’s Crimean Peninsula. Kerry met later on Wednesday in Paris with his Russian counterpart, Sergey V Lavrov, as part of an attempt to arrange the first face-to-face talks between representatives of the Russian and interim Ukraine governments since the crisis boiled over. The Russians have refused to recognise the interim Ukraine government’s legitimacy. 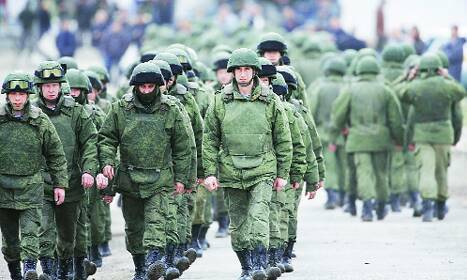 Lavrov insisted earlier Wednesday in Madrid that Russia had no control over “self-defense forces” in Crimea, which Russian troops have effectively occupied, surrounding and neutralising the thin Ukrainian military presence there. Meanwhile, Reuters reported that Russia accused Ukraine of “hallucinating” on Wednesday after Kiev warned a UN atomic agency meeting of risks to the safety of its nuclear power plants in case of a Russian invasion, diplomats said. Envoys of the two neighbours engaged in a fiery verbal exchange during a session of the 35-nation governing board of the International Atomic Energy Agency (IAEA), diplomats who attended the closed-door discussions said. The standoff in Crimea, and the larger struggle over Ukraine, the former Soviet republic that is deeply intertwined with Russia economically, are at the heart of these diplomatic and financial maneuvers. The offers of loans are crucial, because Ukraine is in dire economic shape, with a promised Russian loan of $15 billion in abeyance since the ouster of Yanukovych and Russia’s decision on Tuesday to cancel a large discount on natural gas supplies. The American and European offers are also intended to answer political criticism in Washington and some European countries that the West is not doing enough to support Ukraine.